This photograph shows the Atchison, Topeka and Santa Fe Railway Company depot at Lawrence, Kansas. The building, located at 413 E 7th Street in Lawrence, Kansas, was designed as a "Midwestern Modern" architecture structure by Warren Corman and Warren Jones, graduates from the University of Kansas. Construction began on the depot in 1955 and was completed a year later in 1956 to become part of the Eastern Line of the Eastern Division in the First District of the ATSF system. Today, the facility is operated by Amtrak for passenger service. 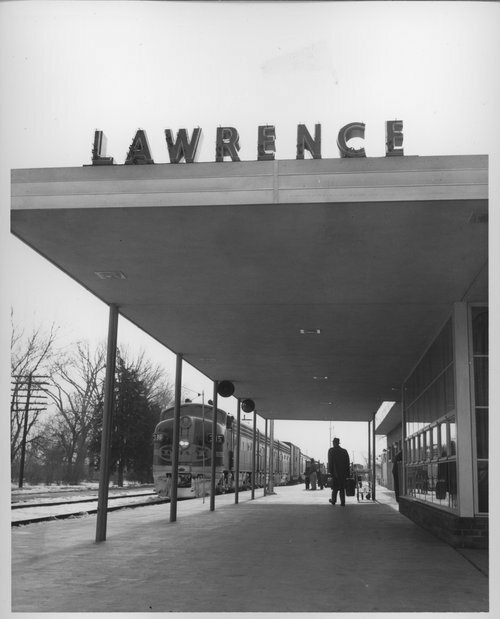 In June of 2008, a group of concerned citizens formed a non-profit organization called Depot Redux which would seek federal assistance for the restoration of the depot and transfer ownership of the building from Burlington Northern Santa Fe Railway to the city of Lawrence.